Biography/Paintings Of Dutch Expressionist Painter. 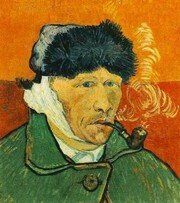 Vincent, after severing his left ear. NOTE: For analysis of works by Dutch expressionist painters like Van Gogh, please see: Analysis of Modern Paintings (1800-2000). One of the most influential figures of the Post-Impressionism movement in France, Vincent Van Gogh is also seen as a seminal pioneer of 20th century Expressionism. His use of colour, rough brushwork and primitivist composition, anticipated Fauvism (1905) as well as German Expressionism (1905-13). Although he didn't start painting until the final 10 years of his life and failed to sell a single work during his lifetime, his paintings and drawings are now some of the world's best known works of modern art. In 1990, his Portrait of Dr. Gachet sold for $82.5 million, while in 1998 his Portrait of The Artist Without A Beard sold for $71.5 million. 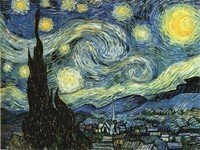 As a result, Van Gogh is now - along with Picasso and Warhol - one of the greatest modern artists. Why is Vincent Van Gogh such a popular and successful artist? First, he lived a short but fascinating life which ended in suicide; second, many of his works are autobiographical, a fact which lends extra significance to his paintings; third, his style of painting - vivid colour slapped onto his canvases with broad brushstrokes of thick impasto paint - was genuinely revolutionary, and inspired generations of 20th century painters. In particular, his highly animated style of gestural painting began a tradition which was later developed by members of the New York School. His greatest expressionist paintings include: The Potato-Eaters (1885, Van Gogh Museum, Amsterdam), Twelve Sunflowers in a Vase (1888, Neue Pinakothek, Munich), Drawbridge with Carriage (1888, Kroller-Muller Museum, Otterlo), Cafe Terrace at Night (1888, KMM, Otterlo), Van Gogh's Bedroom in Arles (1888, Musee d'Orsay), Self-Portrait with Bandaged Ear (1889, Courtauld Institute Galleries, London), Starry Night (1889, Museum of Modern Art, New York), and Wheat Field with Crows (1890, VGM, Amsterdam). The largest single collection of his work is at the Van Gogh Museum in Amsterdam. of Van Gogh's short career. painted just before his suicide. Born into a very religious family - his father was a Protestant minister - Van Gogh displayed a lively talent for drawing as early as 9 years old, but it wasn't until much later (at the age of 27) that he eventually pursued his true vocation as an artist. He actually began his working life as an employee of the Goupil Art Gallery (at branches in The Hague, London and Paris). In 1878, in pursuit of his first vocation to become a priest, he started studying theology, but did not graduate due to his overly mystical determination to follow in "Christ's footsteps". However, his urge to save souls and help the poor, led him to work as an evangelist in one of the poorest mining areas in Belgium, from which he was driven out in 1880, the year he decided to become a painter. He began his career as an artist with the moral and financial support of his brother Theo, with whom he maintained a continuous correspondence throughout his life. The main sources of inspiration for his art included Biblical stories and the works of Emile Zola, Victor Hugo and Charles Dickens, as well as paintings by Honore Daumier (1808-79), and, above all, the Realism of the pious Jean-Francois Millet (1814-75). the swirling patterns in the picture. Van Gogh's art career falls into two main periods - broadly speaking corresponding to his periods of residence in The Netherlands and France. A short but important period spent in Antwerp acted as a link between Holland and France. Meantime, the French period falls into four parts: Paris, Arles, St Remy and Auvers-sur-Oise. Van Gogh's Dutch period (when he stayed in Etten, The Hague, Drenthe and Nuenen) reflects his experiences in the Borinage, the Belgian coal mining area close to the French border. He determined to perfect his drawing, studying wood-engravings and lithographs in the copies of the Illustrated London News which he had kept from his earlier stay in London (1863-5). He also explored watercolour painting (Rooftops, 1882) and arrived at oil-painting only after several years of patient effort. In The Hague, where he worked briefly with Breitner on studies for street scenes, he was given his first and only commission: twelve pen-and-ink drawings of views of the town. It came from his uncle, a picture dealer in Amsterdam. It was also in The Hague that he executed a black-lead drawing of Sorrow (April, 1882) an allegorical figure for which Sien, the pregnant prostitute with whom he was cohabiting, was the model. The theme of despair, the purely graphic style, and the feeling of acute tension that make this a masterly example of proto-Symbolism, are comparable to works by Gustav Klimt (1862-1918) and Egon Schiele (1890-1918). Van Gogh mastered the technique of drawing at Nuenen where his subjects - ordinary men and women such as peasants and weavers, usually at work - were depicted with an instinctive sympathy and were never exaggerated (Peasant Gleaning, 1885, Kroller-Muller Museum, Otterlo). His paintings were characterized by dramatic chiaroscuro and impasto, as well as an expressive foreshortening recalling certain aspects of Hals and Rembrandt; "I'm sorry that so many of today's painters deprive us of bistre and bitumen, with which so many fine pictures have been painted," he replied to his brother, who, from Paris, where he had been working since 1880, tried to persuade Vincent to lighten his palette as Impressionist painters were doing. The culmination of the Dutch period was The Potato-Eaters (1885, Van Gogh Museum, Amsterdam). Although not one of Van Gogh's best works, it is important for its historical significance and for the understanding of his art. Later, in the asylum at St Remy, Van Gogh remembered it with nostalgia when recalling his time in the north. "I have tried to make it clear how these people eating their potatoes under the lamplight, have dug the earth with those very hands they put in the dish, and so the painting speaks of manual labour and how they have honestly earned their food." 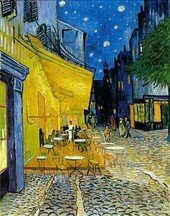 Van Gogh did not fully blossom as an artist until he went to Paris in late Feb 1886. Until then, his chosen colours were gloomy browns, and his paintings were characterized by heavy forms. There was no sign of the vivid colour painting and lighter compositions of his later, more famous pictures. He was strongly influenced by the realism of Millet, whose idealization of the rural poor he admired. From the end of November 1885 until the end of February 1886 Van Gogh was in Antwerp. It was an important period in his career, for it marked the development of his interest in colour under the dual influence of Rubens, whom he discovered in the museums, and Japonism - notably the Japanese Ukiyo-e prints that he had collected (he later owned about 200). In addition, it was in Antwerp that he began his cycle of self-portraits when he painted the astonishing Skull with Cigarette (1886, Van Gogh Museum, Amsterdam), a rare piece of black humour, reminiscent of the complex Belgian symbolist painter James Ensor (1860-1949). But it was in Paris - where he lived with his brother Theo from February 1886 to February 1888 - that his vision was transformed. During his 2-year stay in the city, Impressionism was still high fashion within artistic circles, with Neo-Impressionism - the creation of Georges Seurat and Paul Signac - being the cutting edge variant. After a short time working under Cormon in his studio, where he met and became friends with Toulouse-Lautrec (1864-1901), his brother Theo introduced him to the founders of Impressionism, including Monet (1840-1926), Renoir (1841-1919), Sisley (1839-1899), and Degas (1834-1917), as well as the Neo-Impressionists Georges Seurat (1859-1891) and Paul Signac (1863-1935). Van Gogh joined forces with Camille Pissarro (1830-1903) and Emile Bernard (1868-1941) in becoming a regular visitor to Julien Tanguy's shop. During 1886 his palette lightened, and this became especially noticeable in his flower paintings (Geranium, 1886). From a study of his Japanese art (sometimes most faithfully copied on canvas) Van Gogh absorbed a freer type of composition and the use of planes of flat colour. He also explored Seurat's Pointillism (an offshoot of Divisionism), a form of Post-Impressionist painting quite at odds with his own approach. (See: Self-Portrait with Felt Hat, 1888, Van Gogh Museum, Amsterdam). The passionate intensity of his period at Nuenen, still visible during his first months in Paris (Head of a Woman, 1886), disappeared in a series of works that are full of vivid light and feeling, and marked by a liveliness of execution and fresh colours, with whites, pinks and blues predominating. Long discussions in Paris with Gauguin and Bernard, two of the most innovative Post-Impressionist painters, however, convinced Van Gogh that he should abandon Impressionism and related styles. And so, in February 1888, after completing more than 200 paintings, Van Gogh left Paris for Arles, hoping to find in the Midi (which Lautrec had recommended to him) more light and colour. Over the next 12 months, he tried to convey by emphatic contours and heightened effects of colour the reality of his feelings about a subject. His artistic conception was thus part Expressionist, part Symbolist. Above all, it was spontaneous since he worked at great speed and with great intensity - determined to catch a mood while it possessed him. Realizing that the development of his art must henceforth follow the path of colour, he reacted very quickly against Impressionism and it's allusive character (Pont de l'Anglois, 1888, Kroller-Muller Museum, Otterlo). It was this concentration on line and colour that had interested him in the Japanese prints (Plaine de la Crau, 1888, Van Gogh Museum, Amsterdam) and in Gauguin (1848-1903), whom he admired, and who, at his invitation, came to stay with him in Arles (20th October 1888). This first experience of shared artistic life ended with the crisis of December 23rd, following an argument with his visitor, when Van Gogh tried to attack Gauguin and then cut off part of his own left ear: see, Self-Portrait with Bandaged Ear (1889) Courtauld Institute Galleries, London. Apart from its pathological implications (the first signs of the epileptic nature of Van Gogh's subsequent illness), the incident is revealing of the different temperaments of the two artists. Gauguin was fundamentally classical, even in his quest for wide oceans and lost paradises. Van Gogh, whose conflicts were always dramatcally resolved, worked in a modern style. During the 18 months of life that were left to him, Van Gogh tried, by working furiously, to hold back the fits of insanity that intermittently attacked him. Gauguin's influence, which was not very beneficial in some paintings where the arrangement is too studied (Memory of the Garden at Etten, November 1888, Hermitage), elsewhere was more successfully absorbed as in the Dance Hall at Arles (1888, Musee d'Orsay) or in the final version of The Rocking Chair, (1889, Staechelin Collection, Basel). La Berceuse was painted soon after Van Gogh had left the hospital in Arles after an enforced stay in March 1889. While he was there, he had been visited by Signac, but had suffered from the hostility of other patients. In May 1889, after further symptoms of mental disturbance, Van Gogh asked to be temporarily admitted to the asylum at Saint-Remy-de-Provence in order to be under medical supervision - painting was, he believed, his only way of keeping sane. He remained as a voluntary patient at the asylum for a year, from May 1889 to May 1890, during which time he was attacked by several terrible bouts of madness, which left him utterly prostrate. These periods of residence at Arles and St Remy, however, produced many fully developed works, landscapes, flower paintings and portraits. In these Van Gogh used colour in a very personal manner, based on the harmony of yellows, greens, blues and purples (Poplars, 1889, Neue Pinakothek, Munich; The Hayrick, 1889, Kroller-Muller). The broad planes soaked in heightened colour that formed his backgrounds (L'Arlesienne, 1888, Metropolitan Museum of Art NY and Musee d'Orsay), as well as the heritage of Japanese prints and Gauguin's influence, increasingly gave way to a dynamic animation and the broken brushstrokes of Neo-Impressionism (Olive Trees, 1889, Kroller-Muller), although the real origin of the technique was to be found in his drawings done in the Japanese fashion with bamboo or cut-reed (La Crau, View from Montmajour, Arles, 1888, Van Gogh Museum, Amsterdam). Although Van Gogh had stated that he aimed to express with red and green, violent human passions, he, in fact, used warm tones very sparingly. Some of his Arles portrait art, for instance, is governed by strong drawing with concise accents and ostentatious but thin colour (Young Man with a Cap, 1888, private collection). Those portrait paintings completed at St Remy, however, are distinguished by sinuous supple handling and a more impastoed surface (Portrait de Trabu, (an attendant at the asylum, 1889, private collection). These characteristics are also typical of the landscape painting that Van Gogh produced at Auvers-sur-Oise (The Church at Auvers, Thatched Cottages at Cordeville, Musee d'Orsay) the village where he spent the last three months of his life (May-July 1890). But these pictures, harsh and uneven in style, were the first signs of a growing anguish before the threat of new breakdowns. Meantime, art critics were at last beginning to praise his work. Back in January 1890 an article by Albert Aurier in the Mercure de France had drawn attention to Van Gogh's art for the first time. In February Theo had informed his brother of the sale of one of his paintings, Red Orchard (now in the Pushkin Museum, Moscow) at the Salon in Brussels for 400 francs to the Belgian artist Anna Boch. In May 1890, homesickness drove him to stay with Dr. Paul Gachet, a doctor-artist living in Auvers-sur-Oise near Paris, who had been recommended to him by Pissarro. Later Van Gogh executed two versions of Portrait Of Dr Gachet both of which highlight the physician's melancholic disposition. In both he is shown sitting at a table, supporting his head with his right arm. Both works, now considered to be two of his best expressionist portraits, were completed by Van Gogh during his short stay with Doctor Gachet in Auvers-sur-Oise close to Paris, while undergoing treatment for his mental condition. Gachet was a keen painter himself and Van Gogh was delighted to be able to paint someone who understood his work. Both portraits were executed in June 1890 shortly before Van Gogh's suicide. The first version became famous in May 1990, when it was bought at a Christie's auction in New York for $82.5 million - a world record for a painting at the time. According to subsequent accounts, the picture was resold to a private collector. (For more information, see: Most Expensive Paings: Top 10.) The second version of the portrait is in the possession of the Musee d'Orsay in Paris. Van Gogh completed 70 oil paintings during his 70 days in Auvers, including Wheat Field With Crows (1890) - surely one of his most famous landscape paintings with its ominous black birds. Tragically, Dr Gachet's treatment was unsuccessful. His patient's depression deepened, and thus on 27 July 1890, at the age of 37, Vincent Van Gogh walked into a field and shot himself in the chest with a revolver. He died two days later. He left behind a vast collection of some 900 paintings and 1100 drawings and sketches, the majority painted in his final years. Van Gogh experienced enormous suffering at the hands of a world which he loved but which did not love him. In response to this rejection, Van Gogh used painting to create his own world - a world full of colour and movement, which contains all his emotions, making him one of the great expressionist painters of the 19th century. For details of the reaction to his work in the Netherlands, see: Post-Impressionism in Holland (1880-1920). His passionate, autobiographical art exerted a complex influence on his contemporaries and followers. To the Fauves he showed how composition could be achieved through colour and to the Expressionists, more occupied with moral significance, the symbolic part that colour could have. The paintings of his French period played a greater part in the evolution of modern art, while his Dutch paintings aroused less interest until the First World War, when the Belgian-Dutch Expressionist school found inspiration in the harsh virtues of an existence lived close to the soil. But note his profound influence on the Worpswede modernist Paula Modersohn-Becker (1876-1907). Van Gogh's true descendants may well be found here, particularly in the later works of the Belgian expressionist Constant Permeke (1886-1952), painted when he lived in Jabbeke. 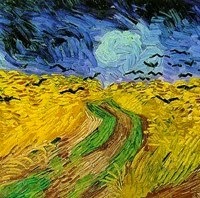 In Van Gogh's last pictures, such as the Cornfield with Crows and Trees, Roots and Branches (both Van Gogh Museum, Amsterdam), the feverish haste of the execution and the closeness of the viewpoint, entailing some loss of identity for the motif, herald some contemporary movements, notably Abstract Expressionism. As well as his oil painting, Van Gogh's graphic art - watercolours and drawings in many different techniques (Indian ink, graphite pencil, black pencil, charcoal and charcoal soaked in oil) - was also outstanding: see, for instance, the intensity of Cornfield with Cypresses (1889, Van Gogh Museum, Amsterdam). Note: Along with Cezanne and Gauguin, Van Gogh was a central artist in the landmark Post-Impressionist London exhibition, entitled: Manet and the Post-Impressionists (1910), organized by Roger Fry (1866-1934). Van Gogh's pictures hang in many of the world's best art museums. There are particularly fine collections in Amsterdam (Stedelijk Museum and the Van Gogh Museum, opened in 1972) and at Otterlo (Kroller-Muller Museum) where the public collections make up almost half of his entire output. In Paris, the Musee d'Orsay has about 20 paintings from the last years of the artist's life. Most imporant American art museums have some of Van Gogh's greatest works. They include: the Museum of Fine Arts Boston, the Chicago Art Institute, Fogg Art Museum Cambridge, Detroit Institute of Arts, Barnes Foundation Merion, New Yale University Art Gallery, Metropolitan Museum and MoMA New York, Philadelphia Museum of Art, Toledo Museum of Art, the Phillips Collection and the National Gallery of Art in Washington DC. - Beach with Figures and Sea with a Ship (1882) VGM. - The State Lottery Office (1882) VGM. - Peasant Woman (1885) E.G.Buhrle Collection, Zurich. - Peasant Man and Woman Planting Potatoes (1885) Kunsthaus, Zurich. - The Potato-Eaters (1885) VGM. - Head of a Dutch Peasant (1885) Musee d'Orsay, Paris. - Skull with Cigarette (1886) VGM. - Montmartre. Paris (1886) Art Institute of Chicago. - Terrace of the Cafe "La Guinguette" (1886) Musee d'Orsay. - Self-Portrait with Straw Hat (1887) Detroit Institute of Arts. - Woman at a Table in the "Cafe du Tambourin" (1887) VGM. - Self-Portrait in a Grey Felt Hat (1887) Stedelijk Museum, Amsterdam. - Portrait of Pere Tanguy (1887) Stavros S. Niarchos Collection. - Self-Portrait with Straw Hat (1887) VGM. - All-Night Cafe at Arles (1888) Yale University Art Gallery. - Vase with Daisies and Anemones (1887) Kroller-Muller Museum, Otterlo. 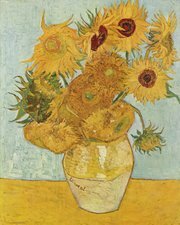 - Twelve Sunflowers in a Vase (1888) Neue Pinakothek, Munich. - Drawbridge with Carriage (1888) Kroller-Muller Museum, Otterlo. - Drawbridge with Lady with Parasol (1888) Wallraf-Richartz Museum, Cologne. - Sunflowers (1888) National Gallery, London. - Cafe Terrace at Night (1888) Kroller-Muller Museum, Otterlo. - Van Gogh's Bedroom in Arles (1888) Musee d'Orsay. - The Yellow House, Arles (1888) VGM. - Vincent's Chair with Pipe (1888) National Gallery, London. - The Trinquetaille Bridge, Arles (1888) Kunsthaus, Zurich. - Gauguin's Chair with Books and Candle (1888) VGM. - Self-Portrait (Dedicated to Paul Gauguin) (1888) Fogg Art Museum. - Harvest Landscape (1888) VGM. - Self-Portrait with a Pipe (1888) Private collection. - The Olive Orchard (1889) National Gallery of Art, Washington DC. - Portrait of Madame Roulin (1889) Kroller-Muller Museum, Otterlo. - Self-Portrait with Bandaged Ear (1889) Courtauld Institute Galleries, London. - View of Arles. Orchard in Bloom with Poplars (1889) Pinakothek, Munich. - Courtyard of the Hospital in Arles (1889) Oscar Reinhart Collection. - Irises. Saint-Remy (1889) J.Paul Getty Museum. - Two Cypresses. Saint-Remy (1889) Metropolitan Museum of Art, New York. - Wheat Field with Cypresses, Saint-Remy (1889) National Gallery, London. - Olive Orchard. Saint-Remy (1889) Kroller-Muller Museum, Otterlo. - Starry Night. Saint-Remy (1889) Museum of Modern Art, New York. - The Olive Pickers, Saint-Remy (1889) Private Collection. - Self-Portrait (1889) Collection of Mrs John Hay Whitney Collection, NYC. - Self-Portrait (Blue). Saint-Remy (1889) Musee d'Orsay. - Van Gogh's Bedroom in Arles (1889) Art Institute of Chicago. - Noon Rest (After Millet). Saint-Remy (1890) Musee d'Orsay. - Branches of Almond Tree in Bloom (1890) VGM. - Portrait of Dr. Gachet Seated at a Table (1890) Private Collection. - Dr. Gachet's Garden at Auvers-sur-Oise (1890) Musee d'Orsay. - The Church in Auvers (1890) Musee d'Orsay. - Road w. Man Walking, Carriage, Cypress, Star, Moon (1890) Otterlo. - A Road in Auvers after the Rain (1890) Pushkin Museum of Fine Art, Moscow. - Peasant Woman with Straw Hat (1890) Private Collection. - Mademoiselle Gachet at Piano (1890) Kunstmuseum Basel. - Wheat Field with Crows (1890) VGM. - Village Street in Auvers (1890) Ateneumin Taidemuseo, Helsinki.  For more biographies of great Dutch painters, see Famous Painters.  For more about expressionist painting, see: Visual Arts Encyclopedia.